There is no bigger testimony when brothers and sisters care for one another deeply. It is even more powerful when they do not just talk about it but live it. I know of someone who drives downtown about twice a day, five times a week to help a single mum bring a child to play school. No payment was solicited. No formal request was put in. It is pure love and joy in helping a needy person. Another group of people decided to get out of their comfort zone, dressed down to blend in, and headed to the poorest district in town, to help with some basic chores for the needy. In Vancouver each year, organizations like Union Gospel Mission will hold huge Thanksgiving dinners to feed more than a thousand people, totally free of charge. With the hundreds of volunteers and staff, people focus on simply serving the poorest and the neediest in the neighbourhood. I have seen a fair number of caring and sharing in churches too. I remember how individual small group members will come together to help a member in need, without being asked, without exacting payment in any kind. The generosity and the caring puts into action the basic commandment of God, to love our neighbours because we love God. During hard times, members of a loving community will put aside disagreements and bickerings, to serve one another. Jesus has said to his disciples in John 13:14, "Now that I, your Lord and Teacher, have washed your feet, you also should wash one another's feet." 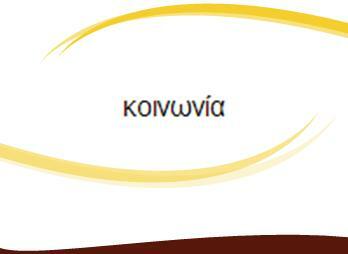 The Greek word for community is koinonia. It is a word that reflects close participation, intimacy, togetherness, with open caring and generous sharing. In Acts 2:42, the word koinonia is translated as "fellowship." I remember my days in the Varsity Christian Fellowship, where caring and sharing are the marks of the community. Once a brother in Christ had a fall and broke his leg. As a result, it impacted his own daily activities. The fellowship of brothers and sisters when they come to know it, went all out to help. From food to school work, from physical healing to emotional comfort, people united to help. The efforts spawned a weekday noontime prayer meeting. The youthful energy among the people in the fellowship is contagious. One caring leads to much sharing of burdens. One sharing leads to spontaneous caring for one another. People grow closer together. Those outside the community become curious. They wonder why these Christians treat one another so well. We have visitors who came, who saw, stayed, and made decisions for God. When koinonia is practiced, the Holy Spirit convicts. When the Holy Spirit convicts, love abounds. When love abounds, Jesus is glorified. For any community to thrive, the common identity is crucial. Central to such an identity is the common vision and mission. The traditional creeds of the Church represent a major statement that gives the community a common identity. Creeds have many advantages. It helps believers to spell out essentials of faith. It anchors the Church on the centrality of the Christian belief. It forms a common bond to give the identity. The word 'creed' comes from the Latin word, 'credo' which means "I believe." Churches many denominations still adhere to the Apostles' Creed. It is that one creed that unites the many different Christian groups all over the world. By the common creed, Anglicans, Baptists, Congregationalists, Methodists, Presbyterians, Pentecostals, Independents, and many other branches of Christianity are able to come together to call one another brothers and sisters in Christ. The traditional creeds also remind all present and future believers, the common historical past we all share. After all, before the schisms, there is only one Church. With identity, unity comes naturally. The problem with our lack of unity is due to our loss of identity. That is why it is crucial for leaders to continue to remind the people about history. Leaders must remember the story of the faith. They must tell the same old story to the next generation, and to teach the next generation to do the same. The story of one's identity must not be forgotten, lest it be forsaken. There is no unity without a common identity. There is no community without unity. A strong remembrance of the story helps to strengthen one's sense of identity. I remember the President of Regent College tells the same story of the institution at every first chapel of each semester. Even when there is only a handful of new students, the entire college community gets to hear how the college began with a tragedy. In 1970, only 6 students were enrolled. The weekend before the start of the first semester, 2 died in a horrific car accident. The famous institution began with an infamous tragedy. Such is a broken past, continually remembered. It reminds all staff, students, and alumni of Regent College that the Christian life begins at a tragedy, when Christ died at the Cross. Thankfully, God has been gracious to turn this tragedy, and to make Regent College one of the most beloved theological schools in North America. As a graduate of this wonderful place, I will not hesitate to recommend this place, and the wonderful community for you to be a part of, at some point of your life. This fourth pillar of the Church is shrouded with images of servanthood, brokeness, and humble living. Community living can only be done if we learn to look out for each other. It is never about us. It is all about God and others, who in turn will look out for us. Just this week, there is a transcript of Dr Richard Teo, a medical doctor who passed away on October 19th, 2012. He was 40. Having made his millions, at his prime, he discovers he had Stage 4 lung cancer. That changes his entire perspective of what life is all about. In his message to a group of students at the Dental Christian Fellowship, this is what he said. You can read more of his transcript here. In independence, we aim to be self-sufficient. When inter-dependent, we aim to help meet one another's needs. Koinonia is more than that. It is more than learning to upend one another to be the best spiritual person. It is much more than simply scratching one another's back where it itches. Koinonia is a common identity in Christ, lived out in community of Christ, and given generously by serving one another for Christ. Whether it is a brother who breaks a leg before the start of a weekly afternoon prayer meeting. Whether it is lung cancer that brings perspective back to Richard Teo. I pray for you and I, that we do not have to depend on an unpleasant event for us to turn back to God. We can help one another turn away from the world, to turn each other toward God, and to walk to God. In the Name of Jesus.